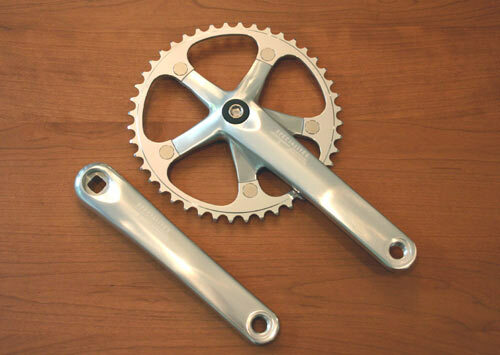 Available crank lengths are 167.5mm, and 165mm only. Alize Deluxe track crankset with 49 tooth 1/8" chainring. We have received a few 2nd generation TA Alize triple crankarms in 175mm. These cranks look the same as the doubles shown just below. But they are just the two cranks, left and right, and they have the 74mm bolt circle studs for the third inner chainring. So itâ€™s a 130x74 triple crank arm set. These do not include chainring bolts, so Iâ€™ve priced those out separately. However they do include pedal washers. In July, 2009, we received a small shipment of the later production Alize cranks, in only two lengths; 172.5mm and 175mm. These came to us as doubles, with 53-39 Alize silver chainrings and steel chainring bolts. 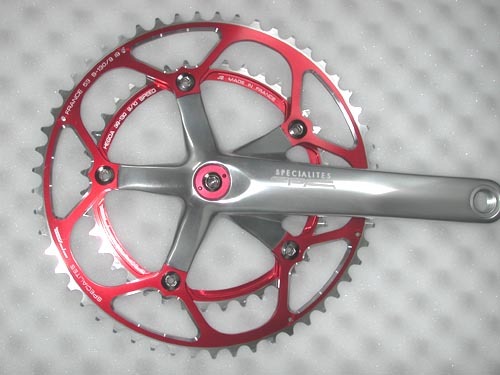 The price for these is $350.00 We will not substitute other chainrings at this price. The photo below shows the correct arms, but not the correct chainrings or crankbolts. The Alize double uses a 103mm JIS bottom bracket axle on a frame with a 1-1/8" or 1-1/4" seat tube. With a 1-3/8" seat tube, use a 107mm or 108mm axle. Alize Light with Red Hegoa chainrings. If you would prefer to get one of these Alize cranks in another configuration, we can do it, but the base cost goes to $400. Then we can change the chainrings, deducting the cost of the rings you don't want, and adding back in the cost of the rings you do want. Essentially, the $350 price is a discount for buying the crank as we received it. And I don't want a large inventory of silver Alize rings in 53 and 39 teeth sizes. This crank can be configured as a single, a double, or a triple. To make it a triple, you'll need an Alize K+ middle chainring, which will allow you to mount a 74mm bolt circle inner chainring. You'll also need a longer BB axle o make space for the third chainring. Alize Tandem with black chainrings. I stock the tandem fronts (captain's) in 175mm and 172.5mm. I stock tandem rears (stoker's) in 172.5mm. Tandem timing rings are black or silver. The black rings have 39 teeth and the silver rings have 40 teeth. Drive rings can be black (in some sizes) or silver. We have very few Alize tandem cranksets in stock as of April, 2009. These are no longer made. Alize 2nd Gen track crankset. Available arms: 175mm only. Chainrings use 1/8"chain only. Available Outer rings in Silver: 48t, 50t, 52t, 53t, 54t, 55t, 56t. Available Outer rings in Black: 48t, 50t, 52t, 53t, 54t. Available Middle rings in Silver: 38t, 40t, 42t, 43t, 44t. Available Middle rings in Black: 38t, 39t, 40t, 42t, 43t, 44t. Available Inner rings in Silver: 24t, 25t, 26t, 27t, 28t, 29t, 30t, 32t. Available Inner rings in Black: 24t, 26t, 28t, 30t, 32t. 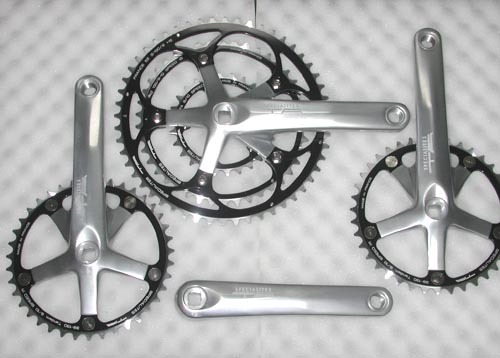 All cranksets are available with the chainring sizes you choose. Add $25 to change to a different size chainring. Axix Bottom Brackets use two 6903 bearings, have 2mm of chainline adjustment, and are available in British (BSC) or Italian threading. Xytech Bottom Brackets use three 6903 bearings, easy bearing replacement, have 2mm of chainline adjustment, and are available in British (BSC) or Italian threading. Two sets needed for tandems. The Alize Triple is no more. But you can use an Alize double set of arms, then add an outer chainring, an Alize K+ tripleizer middle chainring, and an inner 74mm Zelito chainring to make yourself a triple crankset. I get frequent requests for weights of various combinations of cranks and chainrings. One person wants to know how much a 175mm Alize with 52-42-26 rings weighs. Another wants to know how much a 155mm Zephyr with 48-36-24 rings weighs, and what the difference would be if he got a stainless 24 tooth ring instead of aluminum. Well, I don't have all the answers, but I do have some weights for comparison purposes. Alize Triple crankset: 172.5mm arms, 52-42-32 teeth: 760 grams. Alize Double crankset: 172.5mm arms, 52-42 teeth: 670 grams. Alize Light crankset: 172.5mm arms, 52-42 teeth: 630 grams. The "Light" version of the Alize is so much lighter than the "Double" due to the use of aluminum chainring bolts and extra machining off of material from the chainrings. 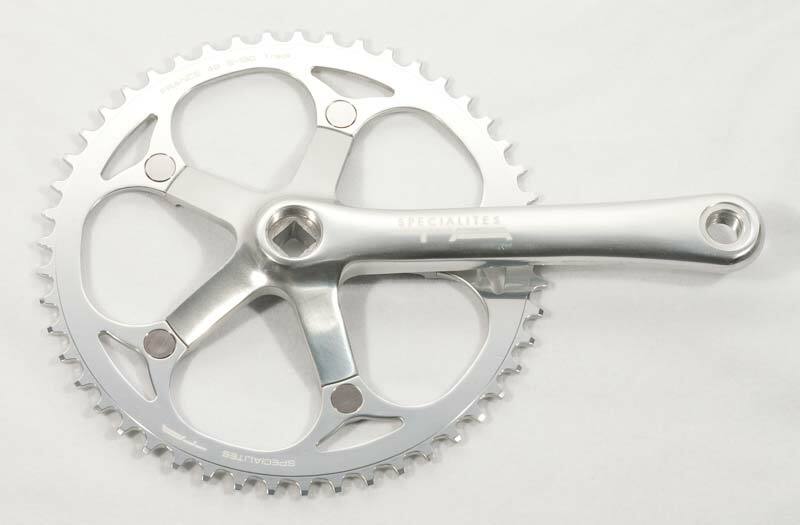 Alize Track crankset: 172.5mm arms 48 teeth single ring: 620 grams. For TA Zephyr cranksets, click here.